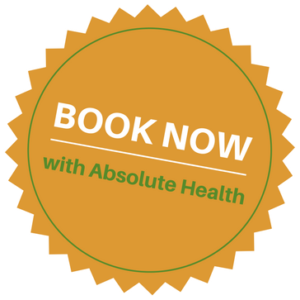 At Absolute Health, our goal is to help you heal and enhance your normal human function and health. We use chiropractic treatments and focus on the balance and integrity of your body’s skeletal framework and surrounding tissues. Every year, 15 million people in North America seek out chiropractic care for a safe, effective and natural method to relieve back pain, neck pain, hip pain, their headaches, sleep problems and low energy levels. Chiropractic care truly has a powerful effect on overall human health. The Association of Chiropractic Colleges has stated that chiropractic is a health care discipline. It is known to emphasize the inherent recuperative power of your body to heal itself. The practice of chiropractic focuses on the relationship between the structure (primarily the spine) of your skeleton and the function (as coordinated by the nervous system) of your body. This relationship between two key areas of your body affect your overall preservation and restoration to better health. Our chiropractic techniques involve hands-on, safe and non-evasive chiropractic manipulation, helping to restore health of the nervous system. The added benefit of chiropractic is that we can work to optimize your overall health, without the reliance upon drugs or surgery. Click here to book your chiropractic appointment. Chiropractors are spinal health experts. Our chiropractors at Absolute Health are expertly trained, meaning they hold a Doctorate of Chiropractic from a recognized university, and have obtained this credential from years of studying and training. In Alberta, our chiropractors must also retain a membership in good standing with the Alberta College and Association of Chiropractors. Our founding chiropractor, Dr. Carole Ross, is also a respected member of the Canadian Chiropractic Association. A chiropractor is equipped to diagnose and treat many musculoskeletal injuries that may occur on your job, or in your day-to-day life. Another goal that you and your chiropractor may have is to improve other health areas affected by your lifestyle, such as sleep quality, decreasing stress or optimizing the health of your digestive system. These are all added side effects when your nervous system is healthier. Upon any injury or trauma, the normal position or flexibility of your vertebrae and/ or bones of the spine can be compromised and altered. Because your nervous system is your master controller of all your living cells, tissues and organs, it also orchestrates and coordinates all of your cellular functions. Your spinal column protects and encases your nervous system (which is your spinal cord and your nerve roots), therefore your spine is responsible for the protection of your nervous system. Our chiropractic treatments are designed to restore your normal or original alignment of your skeletal system. This can greatly help minimize any pain or suffering. 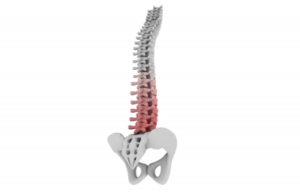 Abnormalities in your skeleton are known as “subluxations”, which are conditions in which any bone or vertebrae in your body has been altered bio-mechanically with any of your adjacent bones. Therefore, we believe that gentle manipulative therapy or an “adjustment” can be very effective in rapidly restoring your body’s normal nerve messages and original bio-mechanics, returning you to a more productive and mobile status. Beyond your chiropractic adjustment, our doctor of chiropractic can also provide you with additional guidance and advice catered to your specific injury or issue. At Absolute Health, we custom design your stretching and strengthening program so that you can become more mobile, strong, and train your body to guard against and reduce future injury and trauma. We’ll teach you proper lifting methods and give you therapeutic exercises. You can find our exercise handouts here. Your chiropractor will be primarily concerned with locating and treating your vertebral subluxations. They will commence your appointment by relying upon several unique and highly refined skills they have developed during their training and years of experience. First, your chiropractor will check your spine for any misalignments, for any fixations or any other abnormalities. If any subluxations or any other abnormalities are detected, your chiropractor will then use gentle force, known as an adjustment, to correct the subluxation in the affected musculoskeletal area. 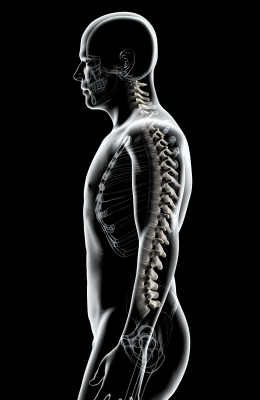 There are a variety of adjusting styles that will be tailored to your chiropractic treatment. 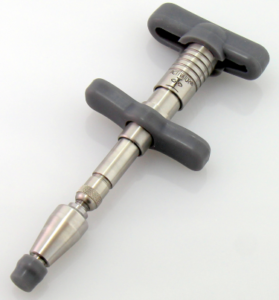 We can use the Activator Method®, which uses a handheld instrument. This technique will deliver a light, gentle, and low-force adjustment to the spine. If you are more delicate or sensitive, we may use this device to treat your condition. Most of the time, our chiropractor uses what is known as the Diversified technique, a classic chiropractic technique which uses a hands-on and manual adjusting method. The specialized table in our clinic is known as a Thompson Drop Table. We use this chiropractic table at Absolute Health to apply your adjustment in a light-force style. 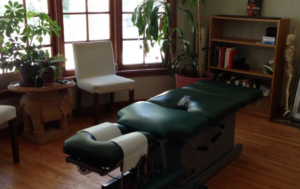 Our chiropractor’s specialized table has areas throughout which allow the table to “drop” during your adjustment, at the neck, chest or pelvic area. In addition, chiropractors can use a variety of specialized techniques, beyond just skeletal manipulation techniques. They can also use techniques which they apply directly to your soft tissue, such as massage. Chiropractors who are mindful of your overall health and well-being will also take the time to provide you with dietary and nutritional counseling. As well, your chiropractor may ask you to complete specific exercises and stretching. These are for your benefit and you will find that some simple physical therapies and lifestyle modifications can greatly speed up your body’s healing process. How Will You Feel After Your First Chiropractic Appointment? You’ll feel an immediate shift to feeling less tension, and feel loose throughout areas of your body. You may not notice a difference right away, especially if your problem or condition has been longstanding. You may experience a little bit of soreness or stiffness the next day. After a brief time this will subside. You may experience an array of unexpected benefits after an adjustment. You may have slept better, your digestion may be improved, you may feel more balanced and calm, and you could experience improved alertness. Another benefit or side effect could result in an enhanced immune system function. Some of our clients at Absolute Health are short-term, looking to heal quickly from an injury that recently occurred, and some return for regular ongoing chiropractic care. What are Common Injuries That Are Treated with Chiropractic Care? Why Do Chiropractors Suggest Orthotics? It is well known that there are many benefits of wearing orthotics in your shoes. Our chiropractor may suggest that you be fitted for custom made orthotic shoe inserts, or shoe implants. Orthotics can help you create greater comfort and stability relating to your spinal mechanics and function. We see athletes and fit them with our orthotic shoe inserts to enhance their performance and reduce potential likelihood of injury. 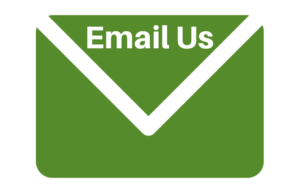 If you would like to learn more about our custom orthotics, click here. What is a Chiropractic Pillow? Many of our patients with neck problems or other spinal injuries and sleep disturbances have found that using a chiropractic pillow helps their body heal rapidly. We all require undisturbed sleep and proper posture when we rest at night. If you would like to know if a special supporting pillow may be helpful for your condition, feel free to ask us at your next appointment, or call us at (780) 448-5888 during office hours, and we will help you find the right pillow to support your healing and recovery process. People of all shapes and sizes and ages can experience a safe and gentle chiropractic treatment. Parents bring their newborns and toddlers to our clinic and we also treat children and teens with chiropractic. Pregnant women and post-natal females come to reduce the discomfort in their pregnancy and after the delivery of their child. We treat high-performing and amateur athletes and active community members. As well, we work with aging seniors who wish to remain more active and independent, and those who have experienced accidents and falls, helping them avoid having to rely on a senior’s home or care facility. We have worked with those involved in motor vehicle accidents or personal work injuries, and are able to work effectively through legal and insurance claims. Whatever your condition, we strive to help you be comfortable and relaxed at every appointment. We want you to have a positive and enjoyable experience so that you can focus your energy on achieving optimum health.